Whole-exome sequencing has become an extremely valuable tool in the diagnoses of rare diseases, of which 80 percent can have an underlying genetic cause. Earlier this week we ran the story of a study from the Center for Individualized Medicine that recommended whole-exome sequencing as a viable option in diagnostic odyssey cases of rare diseases. Now, we present a case study of whole-exome sequencing, with the unique twist of adding RNA sequencing, to illustrate how genomics is advancing the science of health care — and in the process providing patients and their families with a clinical answer. A case study on Oral-facial-digital syndrome was recently award top honors for posters by the American College of Medical Genetics and Genomics (ACMG) for its 2016 Annual Clinical Genetics Meeting. Nicole Boczek, Ph.D., will be at the conference this week to discuss “RNAseq Analysis for the Diagnosis of Oral Facial Digital Syndrome.” Here is the abstract from the poster that Dr. Boczek is presenting this week at the meeting. Oral-facial-digital syndrome is a rare congenital disorder that causes abnormalities in the oral cavity, face and digits. It has an estimated incidence of 1 in 50,000 to 250,000 newborns. Recently, a young boy was seen in Medical Genetics at Mayo Clinic with facial abnormalities, extra digits, and abnormal brain imaging. In collaboration between the Center for Individualized Medicine and the Individualized Medicine Clinic, the patient was tested using whole-exome sequencing. These test results identified two variants in the C2CD3 gene in the patient, one inherited from his mother and one inherited from his father. Variants in C2CD3 have previously been identified in just three individuals with Oral-Facial-Digital syndrome, a condition that has significant overlap of symptoms with the patient. Despite the similarities, the research team could not definitely say the C2CD3 variants identified in the patient were causing his disorder. These variants were predicted to aberrantly affect RNA splicing. RNA is copied from stretches of DNA and acts as a recipe to inform the cell which ingredients are necessary to make proteins. In the patient, if the predictions were correct, the RNA recipe would be disrupted leading to the creation of protein products that are non-functional and likely disease causing. 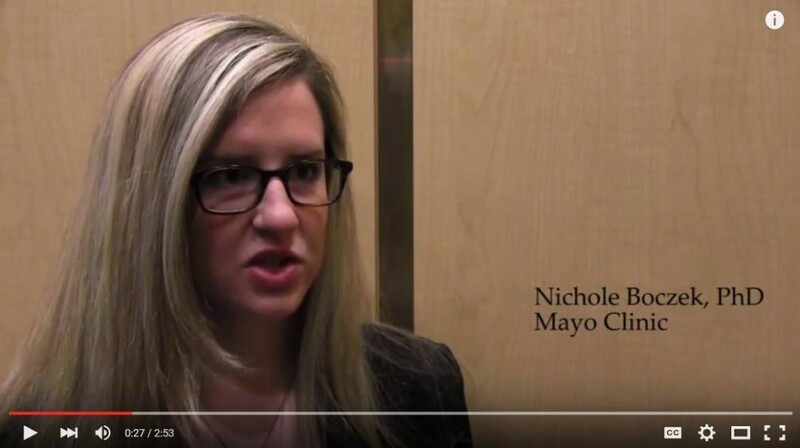 Story by Story, Episode 1: Dr. Nicole Boczek discusses her RNA sequencing research and her ACMG Top Poster Award. The team sequenced the RNA of the patient’s cells and were able to show the C2CD3 variants were indeed leading to non-functional protein encoding products. The findings led to the conclusion that the two C2CD3 variants in the patient were responsible for his phenotype, allowing the clinical team to give the patient a diagnosis of Oral-Facial-Digital syndrome. 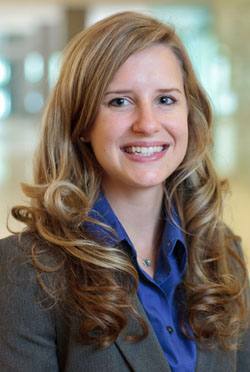 Dr. Boczek is a postdoctoral research fellow in the Center for Individualized Medicine. Her research focuses on functional validation of novel variants of uncertain significance in diagnostic odyssey patients, using a variety of laboratory and bioinformatic techniques to aid in patient diagnosis and to identify genetic causes of disease. Fellow authors on the case study included Patrick Blackburn, Ph.D.; Margot Cousin, Ph.D.; Gavin Oliver, Asha Nair, M.S. ; Geoffrey Beek, M.S., CGC; Pavel Pichurin, M.D. ; and Eric Klee, Ph.D.